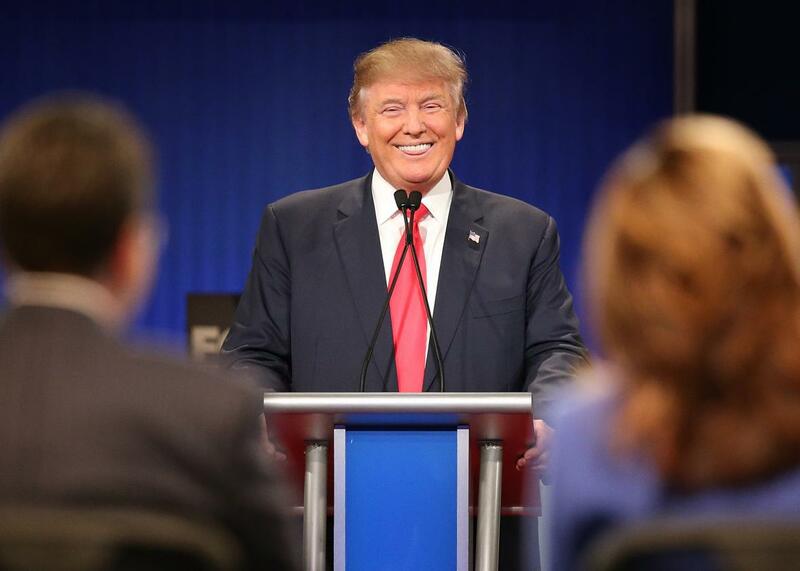 Donald Trump's Fox News debate boycott will help him. Donald Trump’s Debate Boycott Won’t Change the Race. That’s Why He’s Doing It. Donald Trump participates in the Fox Business Network GOP presidential debate at the North Charleston Coliseum and Performing Arts Center on Jan. 14, 2016, in South Carolina. Donald Trump on Tuesday announced that he won’t partake in Thursday night’s Fox News debate, the final Republican showdown before the nominating contest officially kicks off. “Why should the networks continue to get rich on the debates?” the billionaire told reporters at a news conference in Marshalltown, Iowa. “Why do I have to make Fox rich?” Instead, Trump—who has been complaining about Megyn Kelly ever since she and her fellow Fox moderators grilled him at the first GOP debate way back in August—says he plans to hold a competing event in the state to raise money for wounded veterans. Trump’s planned boycott comes as a shock, even from a candidate whose campaign has long been fueled by the predictably unpredictable (and the free media that comes with it). The debate, after all, will take place only four days before the Iowa caucus, where Trump has a very real chance at a race-altering victory and at a time when any other front-runner would avoid making any sudden movements that could interrupt the momentum. And while Trump hinted for days at the possibility of a boycott, such threats were easy to dismiss given that he had made similar ones before previous debates without following through—to say nothing of his never-ending on-again, off-again WWE-style feud with Fox News. Sitting out the Des Moines debate is a gamble, but so would be taking part. Trump would have almost certainly drawn heavy fire from the Fox News moderators and from his chief rival, Ted Cruz. In the past, he’s managed to survive those attacks individually—but he never faced both at the same time. What’s more, his absence will leave Cruz as the only front-runner on stage and, as a result, the focus of a few more broadsides from his polling-challenged rivals than he otherwise might have faced. The boycott, meanwhile, allows Trump to play to type by showing his fans that he’s the give-no-quarter negotiator he brands himself as and once again allows him to flex his muscles for a GOP electorate that loves to see a show of strength. The biggest benefit, meanwhile, is that his decision ensures that Trump will remain the political story in the final days before Iowa. After seven-plus months of relentless coverage, the Donald will sleep easy knowing that Thursday’s Trump-less debate—and the lead up to it—will still be all about Trump. In that way, his decision reflects no change in strategy at all.